Note that even the one group that was least sympathetic to Israel, liberal Democrats, shows that they are 50% more likely to sympathize with Israel than with the Palestinian Arabs. 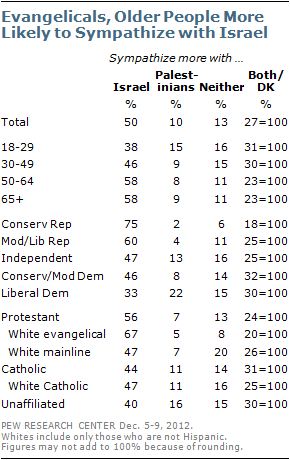 And moderate Democrats were more sympathetic to Israel by nearly a 6-1 margin. Not the 37-1 of conservatives, but still very pro-Israel. This must drive the haters completely bananas. Their shrillness gives the impression that they are mainstream, but they don't represent US liberals any more than Neturei Karta represent Jews. I would love to see how J-Street members would answer the questions.